Trico knows that most homeowners are not at your lake location during the winter and when bad weather hits traveling to the lake and checking your dock can be impossible. You may not even be aware of our weather conditions. That is where Trico’s Dock Watch Program can assist you. We offer two services that you can sign up for. The first is Snow Removal: In the event of any major snowfall (4” or more) Trico has a work order written for anyone on the Snow Removal List and ready to hand out. 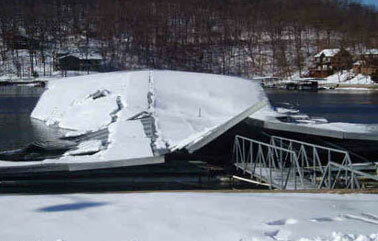 The dock will be checked for snow removal and or proper functioning of dock de-icers and lifts. The second is a monthly program: We will issue a work order for what months you choose. It can be monthly, quarterly, what ever your choice is. Trico will go to your location and check over your dock for example loose cables, low water, ramp connections, hoist up and level, etc. The advantage to signing up for these programs ahead of time, is that your work order is written and ready to go.